Scheduled to launch on December 5th at 1:16 PM EST from Cape Canaveral Air Force Station, Space Tango customer payloads will be making their departure for the International Space Station for the SpaceX Commercial Resupply Services-16 (CRS-16) mission. As we get closer to the final countdown, we invite you to take a look at the amazing science our customers are exploring with us. The Malting ABI Voyager Barley Seeds in Microgravity payload implements a microscale malting procedure in a spaceflight environment. The payload will automate the steeping, germination, and kilning processes associated with malting barley. The resultant malt will be examined upon return against an Earth control. Barley is a versatile grain equipped with antioxidants, vitamins and minerals essential to health. By furthering the knowledge of barley’s response to microgravity, investigators find ways to adapt the grain for long-duration spaceflight. Barley is an important grain used in a large variety of products, from bread to beer. By exposing barley to a space environment, morphological and genetic alterations may arise, broadening the knowledge of the grain and improving its use for terrestrial applications. The Manufacturing Protein-Based Artificial Retinas in Microgravity payload evaluates a thin film manufacturing system that improves upon the current terrestrial protein-based retinal implant technology. The implants are created by utilizing layer-by-layer electrostatic adsorption. The microgravity environment is hypothesized to optimize the process by limiting solution-based aggregation and sedimentation. The payload will investigate the role of gravity on protein distribution, uniformity, stability, and performance of the thin films. LambdaVision, Inc. is developing a high-resolution, protein-based retinal implant to restore vision to the millions of patients blinded by retinal degenerative diseases, including retinitis pigmentosa (RP) and age-related macular degeneration (AMD). Because there is no cure for these diseases and treatments only slow the progression, there is a significant unmet need for the development of a retinal prosthesis that restores meaningful vision to those affected. The patent-protected retinal implant technology developed by LambdaVision uses the light-activated protein, bacteriorhodopsin, to replace the function of the damaged photoreceptor cells. The flexible, subretinal implant is powered by incident light and does not require any external power supplies or bulky hardware on or outside the eye, and offers the potential for far greater resolution than competing electrode-based technologies. LambdaVision is currently at the pre-seed stage but is seeking additional funding to further support preclinical and clinical development. With food production being of concern for long-duration space missions, this research presents an exciting option holding great promise in terms of minimized cost and to maximize efficiency. This research represents the first step towards researching small-scale automated aeroponics in microgravity. Aeroponic behavior in microgravity could provide unique insights to improve aeroponic systems on Earth. 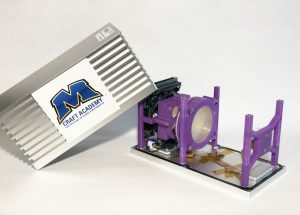 This educational, multi-experiment investigation features four student-designed experiments: one experiment featuring the antifungal properties of A. Vera, one studying the antibacterial properties of several common spaces, a third studying enzymatic reactions, and another analyzing the power-output of a cyanobacterial biofuel cell. Antifungal properties of Aloe vera – This experiment focuses on establishing a baseline measurement indicative of the effectiveness of Aloe Vera as an antifungal in the microgravity environment. Using a bisected petri dish, fungal Candida Albicans will be grown both isolated on yeast malt agar (as a control) and in the presence of A. Vera. In this way, the effect of the extract on Candida growth can be more easily ascertained. Visual data of yeast growth will be collected at regular intervals. Antibacterial properties of common spices – In an attempt to determine whether microgravity affects antibacterial properties of common household spices, this experiment compares the inhibition effectiveness of turmeric, garlic, and ginger. K-12 E. Coli are herein grown on nutrient agar and exposed to discs heavily saturated with the aforementioned spices. The resulting zones of inhibition (if visible) will be imaged. Cellulose activity – Enzymatic activity in the absence of gravity is a phenomenon not well characterized or studied. In this study, the activity of cellulase β-Glucosidase is profiled through the hydrolysis of cellulose p-nitrophenyl-β-D-glucopyranoside. Resulting D-glucose triggers a colorimetric change, which will be imaged and paired with time-stamping so that reactions can be monitored. 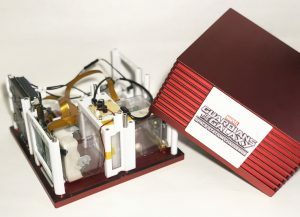 Biofuel Cell – This experiment intends to provide insight into the use of cyanobacteria as a platform for biofuel cell production in microgravity. There is great potential within this niche as demands for generation of sustainable energy are building momentum on and off of the Earth. 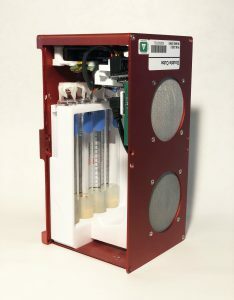 In order to study the feasibility of cyanobacteria energy production in space, the energy produced by a simple biofuel cell will be analyzed for the duration of the mission. The Evaluation of Radiotrophic Fungi experiment features a radiotrophic fungus which utilizes radiation energy as a partial source for sustaining growth. By placing a sample of this fungus on an agar plate and exposing it to the space environment, the rate of growth and life cycle can be observed, giving insight into the feasibility of using radiotrophic fungi as barriers to damaging radiation. Radiotrophic fungi are unique species of eukaryotes theoretically able to perform radiosynthesis, or energy production by means of harnessing radiation. In this experiment, fungi are exposed to the higher radiation levels of the ISS. Images of growth and Geiger counter measurements are regularly captured for comparison to an identical earth study. Research data will be used to explore the potential of using fungi such as these as radiation barriers. Further, it is hoped that information will be gained related to the mechanism of radiotrophism. Research data will be used to explore the potential of using fungi such as these as radiation barriers. The mechanism of radiotrophism has yet to be extensively studied or confirmed. This research has unprecedented potential to give insight (and support) for this theory. Some potential use cases of this information include optimizing the fungi as a potential disposal method for nuclear waste or high-altitude biofuel and nutrition source. The Bacterial Production of Recombinant Proteins in Microgravity experiment explores the behavior and fluorescence of bacteria containing the p-Green plasmid. By imaging the expression of transformed bacteria, the effect of microgravity on the process of transformation and fluorescence is ascertained. Recombinant bacteria (E. Coli) expressing a variant of green fluorescent protein (GFP) are valuable models for transgenic and genomic studies. By understanding the influence that the space environment may or may not have on the process and expression of transformation could be extremely important information used in future studies regarding genetic modification and long-term space travel. Further, information may be gained about the mechanism by which bacteria are able to overcome environmental stressors such as space. Understanding the influence that the space environment may or may not have on the process and expression of transformation could be extremely important information used in future studies regarding genetic modification and long-term space travel. By studying the transformational efficiency of this simple bacteria in the space environment, it is believed that information may be gained helpful to earth-bound scientists looking to expand our knowledge of genetically modified organisms. 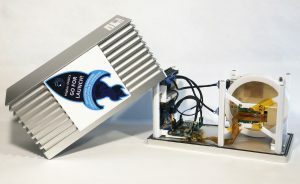 The Evaluation of the Powered Ascent Utility Locker (PAUL) payloads verifies the functionality of thermal and electrical capabilities of the PAUL facility. 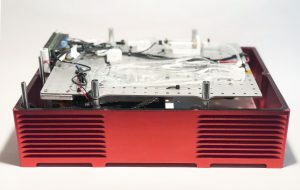 The investigation operates in the PAUL locker, a reconfigurable experiment ecosystem that provides power to payloads on ascent. 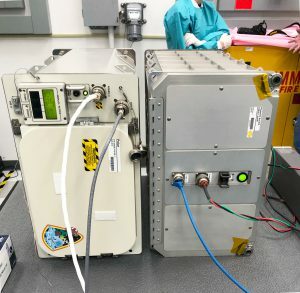 These payloads prove that the PAUL facility can be used to power other payloads on ascent and open the door for future microgravity research to investigations that were hindered by the lack of this capability.